Today marks the final official Australian World War I Centenary dawn service. 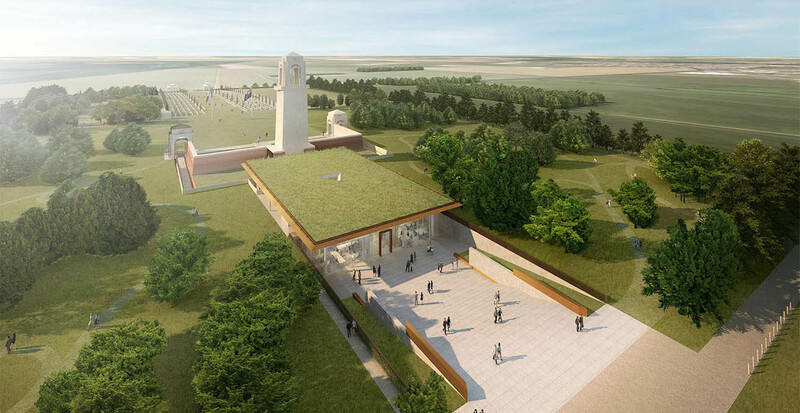 Prime Minister Malcolm Turnbull will be joined by 8000 people at the Sir John Monash Centre in Villers-Bretonneux in France to commemorate the events of 24-26 April 1918 when Australian troops brought the German advance to a halt. Sir John Monash was a giant of a leader, who declined to lead a coup, this we all agree. Born in East Melbourne in 1865 and growing up at Jerilderie NSW, John Monash worked hard to obtain three degrees from Melbourne University: Arts, Law and Engineering. 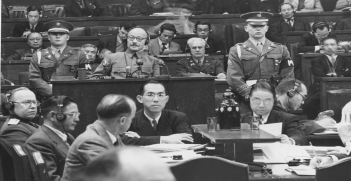 After a successful stint at bridge building and also as an expert witness/lawyer on civil construction cases, Monash stepped up for World War I after years as a Reservist. In recent weeks, the campaign to obtain deserved posthumous promotion of Monash to Field Marshal has swelled but Prime Minister Malcolm Turnbull ruled that there will be no promotion during this Anzac Week 2018. The debate goes on but both sides agree on much regarding Monash. At 11:00am on the eleventh day of the eleventh month, Armistice Day, November 1918, Sir John Monash had exactly the correct rank of Lieutenant General or as some say a three star General. This I agree and almost all agree. 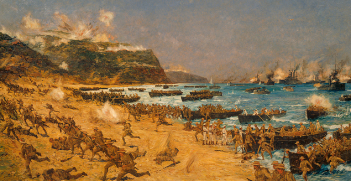 Monash was successfully commanding the five Australian Imperial Force (AIF) Divisions as they put in 100 days of heavy fighting commencing with the small but exemplar Battle of Hamel on 4 July 1918, eventually smashing through the Hindenburg line with difficulty and with allied assistance to victory. I agree Lt General was the correct rank for a Corps Commander of five Divisions, albeit he had at times, thousands of other allied soldiers under command. Just over two months before this, as many are learning for the first time, Monash and notably Pompey Elliott, William Glasgow and their key units had helped turn back the lunge of the Germans under Operation Michael. Villers Bretonneux 100 years ago was a key turning point in this repulse, had the Germans held on and captured the Amiens railway junction, just to the west, then most historians of World War I agree the Germans would have won the Great War throughout continental Europe. 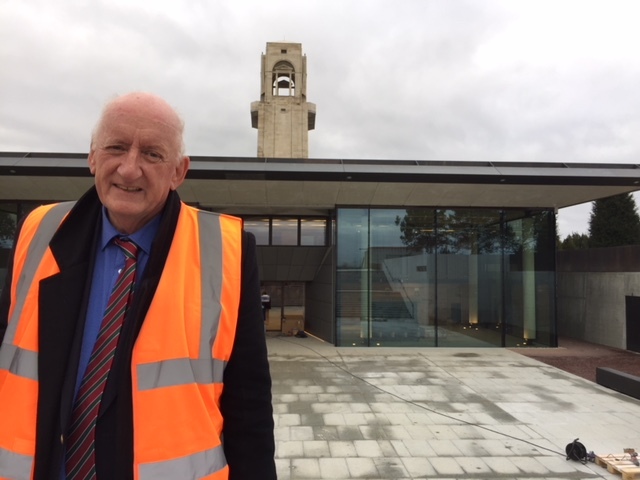 So I salute the then Prime Minister Tony Abbott’s decision to build the first key Australian Western Front Centre near Villers on the Hamel side and just beyond the huge Australian and Commonwealth War Graves Cemetery, complete with a brilliant design and under budget. Most would also agree with the Department of Veterans Affairs’ devised name for the Centre, namely and simply: the Sir John Monash Centre with no rank attaching. In my view, it is absolutely the correct nomenclature and name for this vital icon of Australian history on French soil. 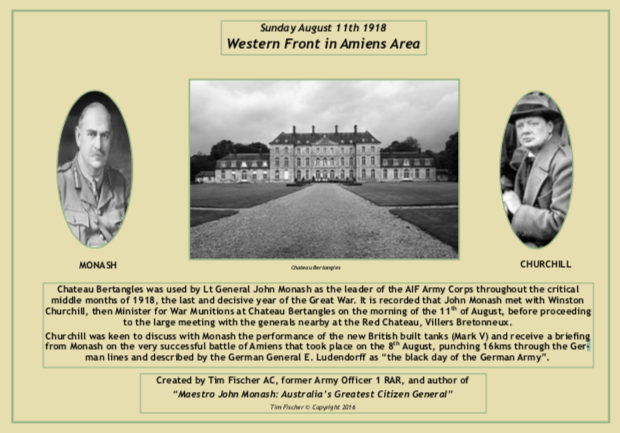 It is also an agreed historical fact that Monash did receive a double knighthood from King George V, one in the field a year after the Canadian Arthur Currie was knighted in Albert FR so 12 August 1918 at AIF Chateau Bertangles and one announced 1 January 1919, in London. It happens this was after the victory banquet at Buckingham Palace, 27 December 1918 attended by the US President, Woodrow Wilson and five Prime Ministers, everyone who mattered and who was around were present. Sitting near each other were Winston Churchill, Singer Sargent and Monash. My book “Maestro John Monash” has the seating plan and shows right next to Monash on his right hand side sat Rudyard Kipling whom Monash had met in Melbourne before the War, it was a night of nights that made WM Hughes jealous of the standing of Monash. As a result, there is the fact that Monash was frozen at the rank of Lt General for 11 years after the 11 November 1918, then on the 11 November 1929 a correction was made with both Monash and Sir Harry Chauvel being promoted to the rank of General or 4 star by Prime Minister James Scullin. There were no Australian awards for Monash, absolutely zero for our non-Duntroon brilliant citizen soldier who entered the army as a private and rose through the ranks as a Reservist, generally agreed even by those in the Canberra triangle of being by far our greatest Citizen General. Finally, in 2107, Sir John Monash will have equalled the years in death that George Washington had reached when the White House promoted Washington one step in rank to the equivalent of Field Marshal. It is agreed that Australia, on so many things, are quicker than the Yanks, quicker into WWI and WWII by years for starters, we do not have to wait that long to do the right thing by Sir John Monash of Jerilderie and Melbourne. One step in rank promotion of Sir John Monash is doable, there are precedents, it cannot open floodgates and is a deserved salute to the man who declined to lead a coup in Australia during the Great Depression. In his letter saying no Monash stated: the only hope for Australia is the ballot box and good education. In many ways our Australian democracy is the real legacy of John Monash, citizen soldier and citizen of excellence. The Hon Tim Fischer AC is a former deputy prime minister of Australia and was Australian envoy to Bhutan.